Please be mindful to park head in and as close to each other as possible. Be careful as the circle has a ice all over. Whether you are aware of the chakra system inside your subtle body or not, chakras or energy centers interact with your spiritual, emotional and physical bodies at every moment. The chakra’s are spirals of energy, one relating to the other, that contribute to our overall well being. In Sanskrit the word Chakra translates as “wheel”. Each wheel spins a particular vibrational speed creating a vacuum that draws in anything it encounters on its level. All of life’s experiences have an effect on our entire selves whether positive or negative. Negative experiences force our chakra’s to close as positive experiences enable them to open. In most of us as we move out of childhood, harsh reality begins to effect one chakra or another and they begin to become unbalanced and stop working in harmony with each other. We get stuck in cetain ways of being, not knowing why or how to move forward.. Blocked energy will eventually end up effecting you emotionally and physically as well. Yoga, body awareness and meditation connects deeply to our chakra system and can act as a rebalancing tool. You may have experienced a deep release when you began practicing yoga. You may even have released cleansing tears or laughter during or after your practice. Each yoga pose directly effects one or more chakras. For instance, backbending opens up the heart and throat chakras while hip openers effect the root and sacral chakras. Incorporating the color, sound and mantra to the corresponding chakra also has powerful healing qualities while meditating. With each coming week, our study will focus on each individual chakra, begining at the root (Muladhara) all the way up the the crown (Sahasrara). 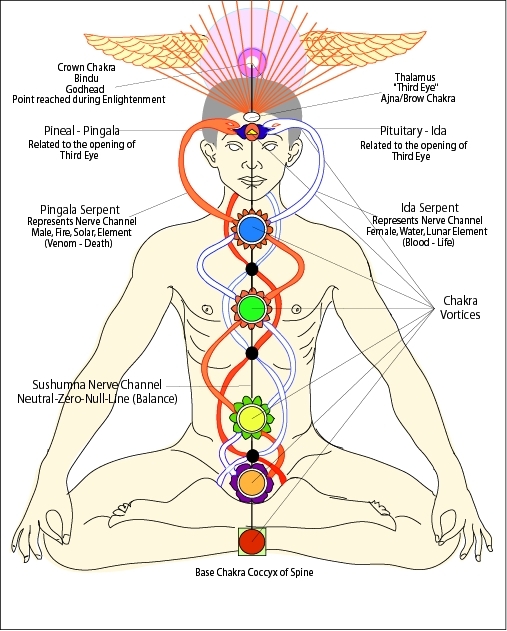 Below is a chart of the chakras, where in the body it is located and its’ individual charactoristics. Next time you feel stuck in a certain area, either emotionally or physically, you may want to check out the chakra associated with your discomfort and work with it in your own way. We do this work not only for ourselves but for the world; When we clear our own inner energies, we can then be open to those around us, being of service with compassion, power, purpose and joy, expressing our dharma in the truest sense. ShaktiPath Kirtan at the Mastics Moriches Library has been moved to May 18th…details will follow. Previous PostFloga rescheduled for Next Sunday February 17thNext PostClass Tonight is On, However…..